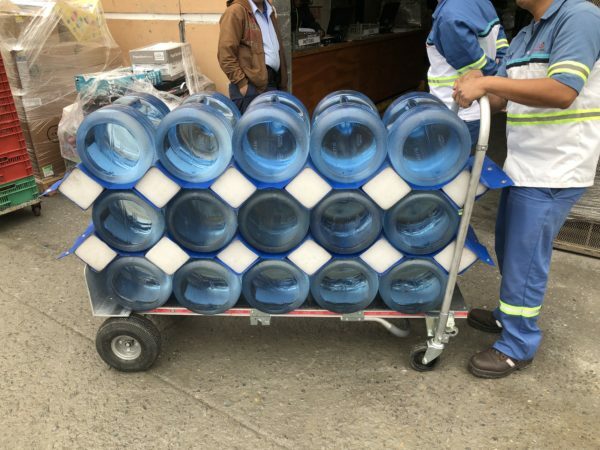 Specially designed to allow the mass transport of 3 and 5-gallon water bottles, the Bottle Hammock is a safe, secure option for moving water bottles around an office or warehouse. When you use the Bottle Hammock, you can be sure all your bottles will remain in one piece and won’t go bouncing off the hand truck. Even when you take our system through rough terrain, it will protect the bottles. This flexible cradle system can transport either full or empty bottles, depending on your needs. We offer the Bottle Hammock for use with all common four-wheel convertible hand trucks so you won’t need to buy a new transport to use it. 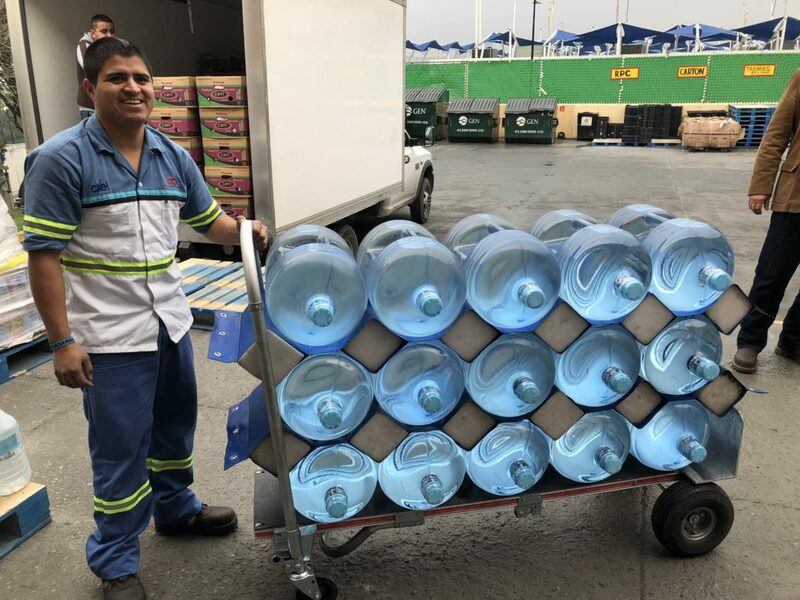 This is just another reason our Bottle Hammock is the economical option to transport your full or empty bottles to your corporate customers. Offices can go through lots of bottled water, but replacing it can be a cumbersome task. Each 3- or 5-gallon water bottle is heavy, and moving them can be difficult if you don’t have a specially formulated transportation system. When you try to stack the bottles on a regular dolly, they’ll fall off. When you place them on their bottoms, you achieve greater stability but you can only transport a few at a time. That’s where our Bottle Hammock comes in. Specially designed to allow the mass transport of 3 and 5-gallon water bottles, the Bottle Hammock is a safe, secure option for moving water bottles around an office or warehouse. When you use the Bottle Hammock, you can be sure all your bottles will remain in one piece and won’t go bouncing off the vehicle. Even when you take our system through rough terrain, it will protect the bottles. 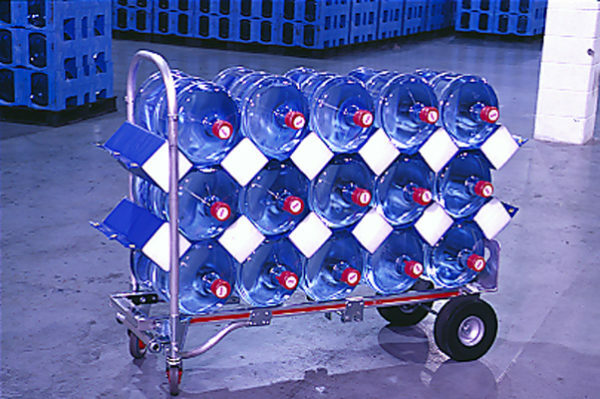 This flexible cradle system can transport either full or empty bottles, depending on your needs. 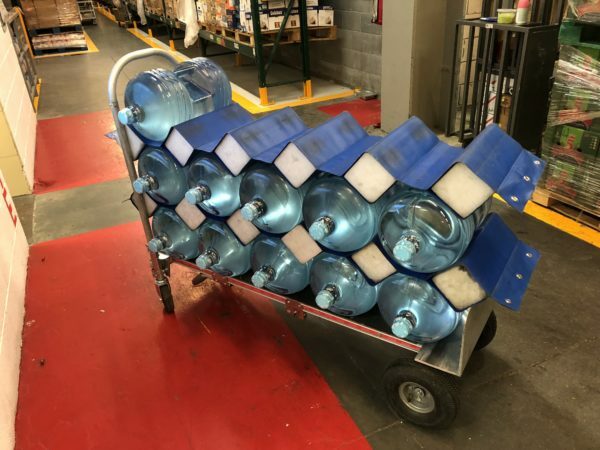 We offer the Bottle Hammock for use with all common four-wheel convertible hand trucks, so you won’t need to buy a new transport to use it. That’s an economical option. Our Bottle Hammock is shipped in cases of four layers per box. It can help prevent bottle damage from hand truck spills, which happens when your items are not properly secured. With the Bottle Hammock, you’ll be safe from jostling bottles and instability that leads to spills. 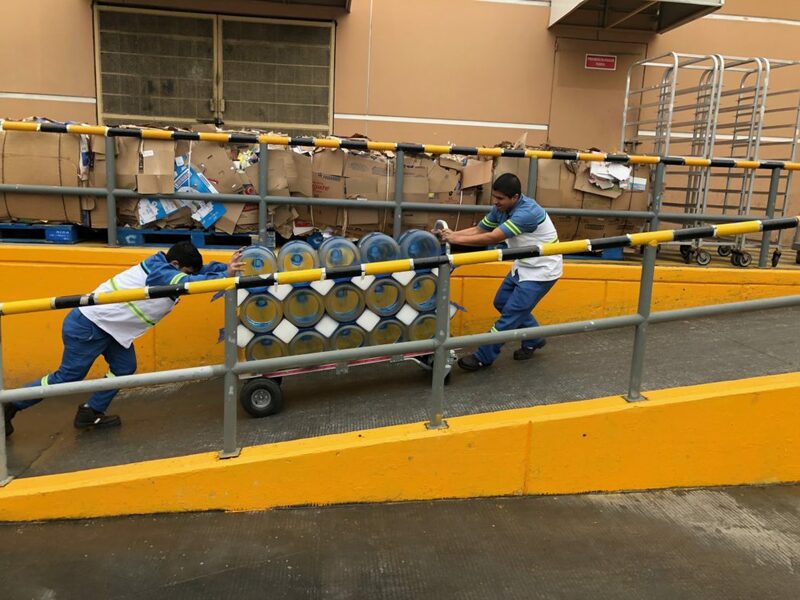 You can deliver more bottles faster and safer with the Bottle Hammock. Cut back on trips to the truck and avoid spills with our efficient transportation. Polymer Solutions International, Inc., has been working with companies in the food, beverage, pharmaceutical, medical and warehousing industries for over 20 years. 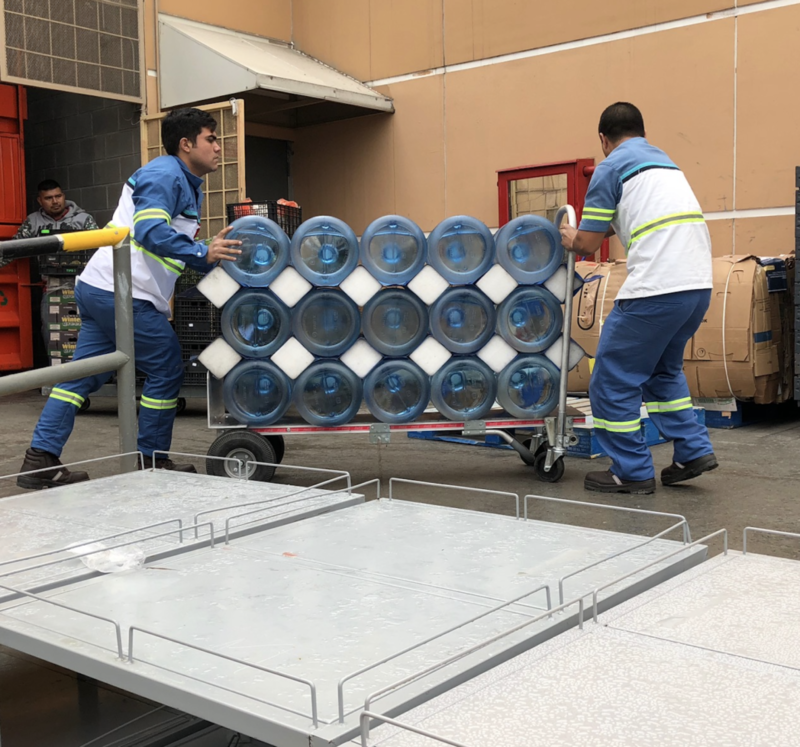 We provide helpful solutions to common problems in the industry, such as protecting your warehoused products from damage or making it easier to get water bottles from your warehouse to your customers. We’ve also increased our commitment to the environment. We now employ reusable packing solutions, ensuring our materials won’t end up in a landfill. We also make many of our products from recycled materials and we promise that when your products reach the end of their lifecycle, we’ll help you to recycle or repurpose it again, cutting back on waste. Let PSI help you with all your material handling needs. Contact us today to discuss what we can do for you.